Cradle cap: A social brain region in infants preferentially responds to speech by about 9 months of age. An inexpensive, noninvasive method has found evidence that babies in The Gambia and in the U.K. show subtle differences in their social brain development. 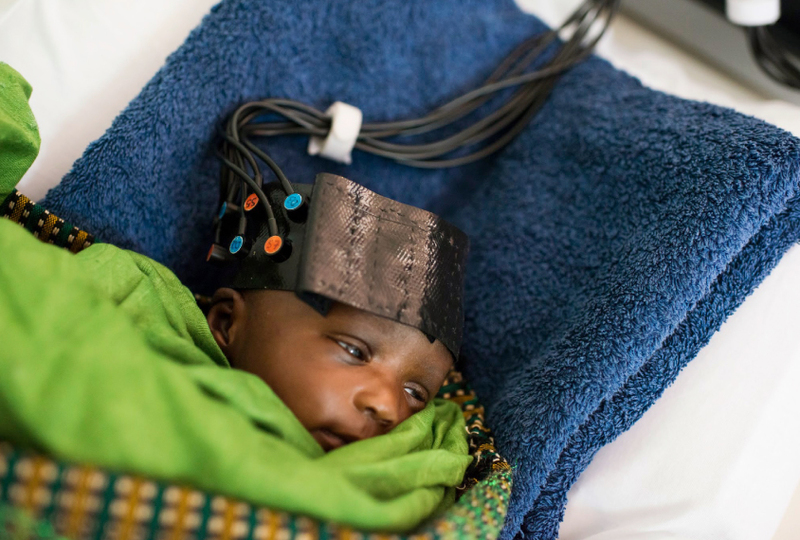 The researchers are using functional near-infrared spectroscopy (fNIRS) to study how the infant brain responds to social information. They presented their unpublished findings yesterday at the 2018 Society for Neuroscience annual meeting in San Diego, California. Most studies that look at brain development in infants are conducted in a handful of wealthy countries. Little is known about typical brain development in low- and middle-income countries, but researchers need this information to understand how to recognize conditions such as autism in these locales. The study was not designed to detect autism; its long-term goal is to understand how inadequate nutrition affects brain development. But some of the methods and techniques the researchers use are also used to study infant siblings of autistic children. fNIRS measures brain activity by using infrared light to track the ratio of oxygenated to deoxygenated blood within the brain. “This technique is quite cheap; it’s portable and it is quite infant friendly,” said Anna Blasi when presenting the work. Blasi is a research fellow at the Centre for Brain Development at Birkbeck, University of London. The researchers recruited 225 children in The Gambia and 60 in the U.K; 17 of the children in the Gambian cohort have since died. Local field workers in The Gambia are recording information about the babies’ socioeconomic conditions, growth, behavior and other factors at seven time points between birth and 2 years of age. They have so far conducted 668 fNIRS sessions. Blasi presented results from an analysis of 100 children in The Gambia and 60 in the U.K. Infants in the study wear a cap fitted with infrared sensors and sit on their caregiver’s lap to watch videos of a woman miming nursery rhymes, with a soundtrack of either speech-like or non-speech sounds. At 1 month of age in both sets of babies, the superior temporal sulcus (STS) — an area of the brain that processes social stimuli — responds more strongly to the non-speech sounds, the researchers found. Between 4 and 8 months, some babies begin to show a stronger response to speech sounds. By 9 months of age, all the babies show a stronger STS response to speech. In a different experiment, the infants listened to a recording of a voice giving a friendly greeting: “Hello! How are you? Thank you for visiting us today!” The U.K. infants heard the greeting in English; the Gambian infants heard it in Mandinka, a common local language. The infants heard the greeting a total of 25 times — spoken by a female voice for the first 15, a male voice for the next 5 and the female again for the final 5. This protocol tests infants’ ability to tune out stimuli that don’t offer new information, a process known as habituation. At 5 months of age, most babies continue to show a brain response to the female voice even when they hear it over and over. “But at 8 months the picture changes dramatically, at least in the U.K.,” Blasi says. There, babies respond only to the first few greetings, and then they tune it out. However, babies in The Gambia continue to show a brain response even at 8 months of age. The researchers are analyzing other data for clues about factors that might explain the differences. So far, the team has found that head size also varies more broadly among the Gambian infants than it does in the U.K. infants. For more reports from the 2018 Society for Neuroscience annual meeting, please click here.